Membership is open to any person over the age of 18 years who is interested in the study of the history of anaesthesia. Applications are considered by Council in accordance with the constitution. The annual subscription is currently £20.00. 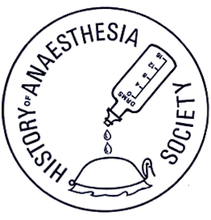 Interested historians should download and complete the application form and post it to the membership secretary, Dr K MacLeod, 36 Green End, Great Stukeley, Huntingdon, Cambs, PE28 4AE along with a cheque for £20 made payable to HISTORY OF ANAESTHESIA SOCIETY.